I would like to draw your attention to the right of my blog where I have made some additions to the Upcoming Classes list. There you will find a Painting from Photos Workshops, that I have added due to popular demand, and because I really see a need for it in the community. Many people are working from photos and are struggling. I derive inspiration from both photos and real life. I know some great techniques and strategies for working from photos. 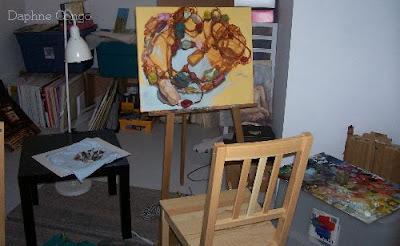 In these workshops you can choose your medium of either acrylic or oil paint. I am also offering Artist Sessions. One is where artists can get the chance to work from real live models. It is hard as an artist, to pay for model time on one's own and the camaraderie from working next to other artist is invaluable. Second I am offering an Artists Working Side by Side artist session where practicing artists can bring in something to work on and/or stuff you want feedback on from other artists. You get to see how and what other artists are working on. It is great for meeting other other artists and the conversations are always interesting. It is open to almost any medium. And, yes, that is not a miss print, the charge is $5.00 to cover the cost of the use of the space and of coffee and tea and such. I have had a few artist sessions already and they are extremely inspiring and energizing. Artists can come and go as they please but I ask that you send me an email or a call so that I know how many artists to expect. Above is a sneak preview. I am feeling a twinge of guilt for not posting any recent paintings lately. I want people to know that I am working on something. So, here it is. A Sneak Preview. It is the long beginnings of my latest painting that is taking me many hours just to get to this point. It is quite a bit larger than most of my other still lifes. I really feel like it is taking me somewhere. All though it is time consuming it is quite rewarding as well. If some are confused on what the subject is, well I have been looking at it for so long that I almost know the image off by heart, it is a colorful beaded necklace. It really lends itself to a feeling of abstraction in it's color and unrealistic scale. It has become all about color, shape, paint, and the relationship of everything to everything. One color determines and relates to the next. The space between the beads is just as important as the beads themselves. I really recommend that others try this as well. It is a great exercise on the act of looking. I spend as much time looking and studying the beads as I do painting them. The beads are so many different colors that it is really challenging my color mixing skills. It is definitely not a monochromatic painting. I often recommend to students that are just beginning to paint, especially in oil paint, is to keep everything simple. I start them off using very small color pallets. Well, this painting is everything but simple. You would think that it being just one necklace that that would keep things simple, but it doesn't. This necklace is so complex. The drawing was very difficult to get it just the way I wanted it. The beads are all different shapes and sizes and I would be drawing what I thought was the scale I wanted and then I would end up with a tiny necklace in the bottom corner of the painting. So I took my camera and took a photo of it from my perspective that I was painting the necklace from. I made it black and white and used it as a compositional reference to get the scale of the beads and necklace to where I wanted it on the canvas. I wanted the composition of the necklace to push to the outer most edges of the canvas. It leads your eye around like a train track visiting all the little jeweled areas where magic happens, ( not the kind where little freaky elves jump out and bite on your ankles, that is not the feeling I'm going for). Like you are taking a trip across the country and you come to find in the different towns and fields, colors and shapes you never knew existed before whether it is in the landscape or in the characters you meet along the way.